Empshott, (VB102) is a small, sparsely populated parish 6 miles north of Petersfield and 2 miles south-east of Selborne with the B3006 running through the parish from Greatham north-west to Selborne. The source of the River Rother is in the area of the hamlet of Empshott Green and forms part of the southern boundary. The land mainly consists of farms with a few small steeply wooded slopes to the east of the steep escarpment of the East Hampshire hangers and in particular Noar Hill. Among the local family names appearing across the centuries are GREENTREE, KNIGHT, SMITH and BUTLER. 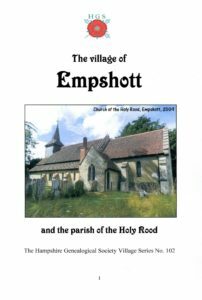 This twelve page booklet includes a great deal of historical information covering Empshott and including not only the gentry but also the teachers and ordinary people. To assist with your research, useful references for Empshott documents and records held at the Hampshire Record Office are given throughout, together with other sources and website addresses for more information.